The second weekend of this year's IndieFest has at least two treats in store. As I've talked about here on HoFB a couple of times, Judy Lieff's Deaf Jam was my favorite film from last year. And catching Deaf Jam once at the Mill Valley Film Festival was not enough for me. I plan to catch it again at one of the two screenings this weekend - Saturday 2/18 @ 12:30pm & Sunday 2/19 @ 5pm. (As a sort of thematic meal and a movie, I plan to finally try out Mozzeria, the Deaf-owned restaurant on Guerrero only a few block from the Roxie Theatre.) For those who didn't click through those hyperlinks to read my past posts here about Deaf Jam, it's a documentary that takes a wide focus on the importance of American Sign Language Poetry in Deaf culture while zooming in on one particular young Deaf poet, Aneta Brodski, an absolutely captivating subject. Besides matters specific to Deaf culture, the film also touches on immigration issues since Brodski came to the U.S. from Israel as a child and her parents only obtained their citizenship after she turned 18. As a result, she is left in legal limbo, something the DREAM Act, if finally enacted by Congress, would rectify. Add to this that Aneta's Hearing poet partner is a Palestinian-American, and you have yet another layer of politics packed into this engaging documentary. Part of why Deaf Jam works so well on screen is because sign languages are visual languages. Sign languages are so perfect for cinema it's surprising how little we see it used in moving pictures. (Thankfully, the San Francisco International Asian American Film Festival is providing us another opportunity to see a moving language in a moving picture with Mina T Son's short Making Noise In Silence, part of the Roots and Reality short film series. Here's a link to an interview I did with Director Son, my last contribution to sf360.org before it folded.) 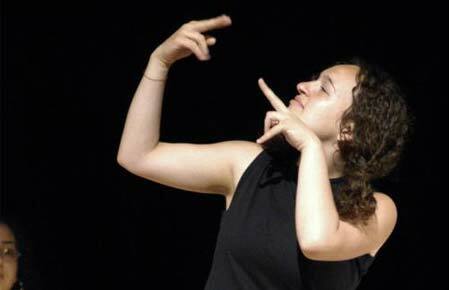 Along with the naturally cinematic language of the Deaf, Deaf Jam Director Lieff also credits her dance background as helping her frame scenes in particular ways because she saw choreography in ASL Poetry performances. Perhaps this is what led Lieff to be comfortable leaving one moment of ASL Poetry un-translated, trusting the body to tell the tale. Girl Walk's somewhat limited attempt at a story involves The Girl (Anne Marsen) who appears to want to get everyone to dance with her, The Creep (John Doyle) who wants to get with the girl, and The Gentlemen (Daisuke Omiya) who's the busker of the bunch and to whom The Girl seems to take a liking. Besides that skeleton of a story, this is just a dance performance that treats New York City like a playground, from the twirls on the High Line to tap-dancing on the bull outside of Wall Street. By dancing in these public, semi-public, and private spaces, and adding a new layer to these places through choreography, ownership of these spaces is brought into question. Just as Girl Talk's digital remixing challenges what is an original artwork and who owns what, Girl Walk creates something out of the accoutrements of these spaces. When Girl Talk meshes General Public's 'Tenderness' with hip hop lyrics that ain't so tender, both songs are deconstructed to be re-constructed into something new, something Girl Talk's own. And now the work of others works that make up Girl Talk's work is even further re-contextualized and newly owned, or re-possessed, in Girl Walk. They take on a new meaning through the bodies interacting with Girl Talk's songs in these spaces. Furthermore, because these dancers occasionally highlight areas like High Line and Madison Square, areas of New York City that have been re-appropriated from their prior uses (a train way and car lanes respectively) in order to expand the availability of public space available to NYC's citizens and visitors, these public spaces are yet further being re-designed by the bodies moving within them. There's even a scene in Girl Walk with a traceur. A traceur is a practitioner of the urban sport of Parkour where cities are used as makeshift obstacle courses. Since the first time a skateboarder afforded a new use for a stair handrail, nothing has re-thought how our bodies interact with our cities more than Parkour. My enthusiasm for Girl Walk exhibited in the words I've typed here is more regarding its potential than it's execution. It's a totally fun film, but not a great film. Those who find that Girl Talk's albums lag at times will probably find the same flaw in the film. (Perhaps we here in San Francisco can make that better film by choreographing a Girl Walk sequel of sequential dances taking place throughout all the Parklets in San Francisco? May I suggest the Marcus Shelby Jazz Orchestra do the soundtrack for our walk?) But it's still very much a film I want to start seeing more of. A film that celebrates the city and how citizens can re-format cities as places more friendly and supportive of our bodies than how they are presently designed for the exoskeletons of our cars and the free/cheap parking we demand to publicly store our private automobiles. To appropriate the recent words of Ellen when reacting to her haters, we need cities that value dance. The San Francisco Film Society has been rocked by tragedy twice now in the past half-year. When its dynamic and beloved execute director Graham Leggatt died of cancer last August, the city's film community grieved mightily. How cruel, then, that Leggatt's successor Bingham Ray fatally succumbed to a series of strokes while at the Sundance Film Festival, less than five months later. He'd been at the Film Society for only ten weeks. This time around, the mournful tributes came equally from voices outside the Bay Area, as as locals had barely a chance to get to know Ray, other than through his heroic efforts as a distributor of independent films nationally, as described in this New York Times article, prior to his post in San Francisco. The Film Society soldiers on, now with Melanie Blum as Interim Executive Director. The team has already begun the first wave of announcements for their biggest event of the year, running April 19 through May 3rd: the 55th San Francisco International Film Festival. In the festival's tradition of pairing contemporary musicians and silent film classics, on April 23rd at the Castro Merrill Garbus and Ava Mendoza will accompany four Buster Keaton two-reel comedies: One Week, The Haunted House, and, co-starring Roscoe "Fatty" Arbuckle, Good Night, Nurse! and The Cook. SFMOMA has announced two May 1st SFIFF screenings of Sam Green's new film The Love Song Of R. Buckminster Fuller featuring a live collaboration with indie band Yo La Tengo, returning to the festival for the first time since 2001. Tickets go on sale Friday, and seem certain to sell out long before the festival begins. Meanwhile, the organization continues to show films daily on its dedicated New People screen. Future bookings include Terence Davies (who will also receive an award from Cinequest in San Jose) introducing his stunning 1992 film The Long Day Closes March 8th. This special screening is sandwiched by screen-sharing with the SF Green Film Festival (March 1-7) and the SF International Asian American Film Festival (March 9-15). Then a series of week-long bookings include Kill List opening March 16 (it also plays IndieFest this month), Sound of Noise March 23, House of Pleasures March 30, and Béla Tarr's haunting final film The Turin Horse April 13. This week audiences at New People can see two films selected for that screen prior to Bingham Ray's strokes. Both are among the richest, most important films of 2011. Both films, quite coincidentally, begin as explorations of the ramifications of an untimely death, and fan out to cover far more thematic territory. Currently playing until Thursday February 16, Once Upon A Time In Anatolia is an epic, ironic example of the police procedural subgenre: a team of cops and bureaucrats spend a sleepless night and morning hunting for the buried body of the victim of an admitted killer. Although I was impressed by the film, I don't feel I have much to say about it that hasn't been better said by Bilge Ebiri, Ali Arikan or, in his final article for the Village Voice before his abrupt firing, J. Hoberman. With its long takes and detailed attention to both image and sound design (the act of hearing with ones own ears?) the film exemplifies the international art house style that we've come to rely on the SFFS to bring to Frisco screens, whether during the festival or year-round, as few other venues are willing to touch such films. Margaret, on the other hand, played the Landmark Embarcadero for a low-attended week last October. It was the best new release I saw all year, so I'm thrilled that the SFFS is bringing it back February 17-23 and I can encourage friends and readers who missed it to catch up. I hope to see it again myself. A second viewing at a recent press screening confirmed that what on first look seemed like a messy, sprawling masterpiece is in fact a carefully-designed sprawling masterpiece. See Once Upon A Time In Anatolia if you can, but make sure you don't miss Margaret. In Margaret, Anna Paquin gives a career-high performance as Lisa Cohen, a Manhattan teenager trying to glide through the challenges normal for a girl of her age and station: maintaining her scholarship at an upper-crust-liberal private high school, experimenting with drugs and boys, navigating fraught relations with her divorced parents and their new romantic partners. Early in the film, her actions contribute to a horrific bus accident; trying to catch the attention of the driver (Mark Ruffalo), he plows through a red traffic light and over a pedestrian named Monica Patterson (Allison Janney in a brief-but-unforgettable role), who dies in her arms. This fatality is perhaps the first thing Lisa has ever felt personally responsible for, including her own behavior and relationships. It doesn't feel good at all. She tries to shunt aside her guilty conscience, living her life as if nothing had happened, but it simply doesn't work. Her every interaction is now colored by her unprocessed emotions. Eventually it's too much for her to take, and (more than halfway into the film) Lisa finally attempts to contact Monica's surviving family members. She helps put in motion a lawsuit against the bus company; perhaps if the driver is fired he'll demonstrate a glimmer of the remorse Lisa feels so deeply but is rarely able to vocalize. Not only does the partial plot summary I've just attempted leave out major characters and incidents, but the very form of a summary may be wholly inadequate to the task of conveying just what is so special about Margaret. This is why we get more pleasure out of watching great movies than reading reviews of them, or worse, of their screenplays. Filmmaking is like a form of alchemy, mysterious and unscientific in the way it can combine elements it's almost impossible to evaluate in isolation, or even to describe with mere words, into a time-based talisman with the power to transmute a viewer's emotional state. Some of the elements in Margaret that I've yet to see adequately described include: the cinematography by Polish DP Ryszard Lenczewski, far more cinematic than that for director Kenneth Lonergan's prior film You Can Count On Me. The plaintively arpeggiated music by composer Nico Muhly. Or the line-readings; there is something perfectly teenage about the way Paquin, who was 23 at the time of filming, says things like "I think I'll stop generalizing now." Perhaps the most powerful element of the filmmaking alchemy is editing. Margaret's editing has been much commented on, but most commentators fixate on the fact that it took half a decade for the current cut to be arrived at by Lonergan and his editors (Anne McCabe is credited as editor, but apparently Dylan Tichenor, Thelma Schoonmaker and even Martin Scorsese had their hands in cutting at various points in the process.) Many of the film's reviews take for granted that Margaret's editing was never satisfactorily completed. Even certain positive notices start from this assumption, and make claims for the film's successful aspects as achieved in spite of flawed editing choices. If this seemed a justifiable reading after a single viewing of the film, a second made it seem ludicrous unless coming from the perspective of a supporter of the continued homogenizing of American narrative filmmaking. Gripes about Margaret's editing generally focus on three aspects of the film, each of which I find integral in context: subplots, transition shots, and "choppiness". Let me take a brief look at each of these three, starting with subplots. Yes, Margaret contains a great number of characters, subplots and scenes which do not seem to support the main thread of the film: how Lisa deals with her role in Monica's death. There are long conversations with parents, teachers, police officers, and others, which do not necessarily advance this storyline, or could do so far more briefly. But the film is as much about how Lisa does not deal with her shared responsibility for the bus accident as it is how she does deal with it. In order for the intensity of her interest in the lawsuit to make sense, we need to see her attempt to live life for a while --for a good chunk of the film, really-- by ignoring it. It's a sad but human truth that sometimes the most effective way to cope with a tragedy is to move on with our lives as if it never happened. It doesn't always work, as when Lisa goes on a date the night of the accident. But this instinct cannot be summed up in a single scene; we have to feel a sense of the duration of her trying to live life without dealing, before it makes sense to see her deal. Lonergan and Lenczewski's transition shots are almost uniformly masterful. This is where much of the film's real alchemy lies, I suspect. A shot of high school boys ogling a female gym teacher cuts to a scene between Lisa and her own teacher-crush, Mr. Aaron (Matt Damon). A late-night mother-daughter conversation is preceded by an exterior view of the family apartment, where it's possible to see through a nearby frosted window that the Cohens' neighbors are up and active at the witching hour too. Typing out descriptions seems to rob these transitions of their power; they seem more banal or heavy-handed than they appear when occurring on screen. But I think they're one of Lonergan's key techniques in constructing a world and our sense of Lisa's place in it. Movies usually show us how an individual might react to love, lust, fear, pain, death, etc. Margaret shows us that, and also gives us glimpses of evidence that everyone in the world is reacting to the same forces all the time. I can't take seriously the critiques of the film which consider unnecessary the Manhattan cityscapes Lonergan and his editors frequently use as transitions between scenes with dialogue. As for accusations of "choppiness" in Margaret's editing, I'm not quite sure what is meant by the accusers although I have a few guesses. There is an elision lying beneath a cut in another, later scene between Lisa and Mr. Aaron at the latter's home, perhaps made more pronounced because it occurs at a reel change. It's a perfectly appropriate elision in my opinion. Another kind of cutting occurs in this scene, introduced in a previous one depicting an intense confrontation between Lisa and Monica's friend Emily. 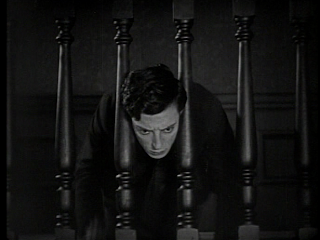 Juxtapositions of two shots taken from similar camera angles, with the characters in frame in approximately similar positions in each framing, seem to tread that borderland between a continuity cut and a classically-defined jump cut, without announcing itself as "technique" as loudly as the latter type of cut tends to do. These cuts don't signify that time has passed, or give us a significantly new angle through which to view the characters, but provide a loss of balance for both the viewer and for the characters. After reaching a level of comfort and/or courage to open up and share a memory of Monica's last minutes with her prickly friend, Lisa upsets Emily, who finds her interpretation of those minutes presumptuous and self-centered. She responds with a blunt but justifiable reprimand to Lisa: "we are not supporting characters in the fascinating story of your life!" Emily's exclamation brings me to one last aspect of Margaret I'd like to touch on before on before concluding this piece. The film is not just a rare modern Hollywood example of art worth engaging with. It's also a container for for an argument that art is indeed worth engaging with, and for artists, worth continuing to create. Though many films center on artists and their worlds, very few films so truthfully capture how central art can be for the ordinary consumer. or how artists can be ordinary consumers of art themselves. I'll end with a few details to support the above claims, though there's so much more packed along these lines packed into the film that it could (and probably will) provide material for a fair number of academic dissertations. The title Margaret comes from a line in a Gerard Manley Hopkins poem read to Lisa's class by a literature teacher (Matthew Broderick) who, like a police detective in the film, eats his lunch at his desk. Lisa's mother (J. Smith Cameron) is a stage actress by profession, and we're privy to a realistic look at how tumult in her personal life informs her performances, and vice versa. Her new suitor (Jean Reno) is an opera lover, and the film's final scenes takes place at a performance of Offenbach's Tales of Hoffman. It masterfully demonstrates that sometimes sharing an experience in a theatre can be the best way to honor the loved ones we have lost, and strengthen our bond with a loved one sitting in the seat next to ours. This post is dedicated to the memory of writer and cinephile Damien Bona, who died far too young on January 29, 2012. He was one of the first and most influential influences in my approach to understanding the cinema, and how its study might weave into my own life. Though he lived in New York and thus I only had the opportunity to meet with him face-to-face once, I always cherished his generosity and his strongly held opinions on movies, politics, cats, the San Francisco Giants (his favorite sports team), or anything else he might have mentioned on a discussion board, in an e-mail, or in one of his books or articles. He was no fan of You Can Count On Me, but I wonder what he might have had to say about Margaret He will be missed by many many more; here are a few lovely tributes.